The Dobro® resonator guitar has been an American classic since its arrival in the early 1920's. 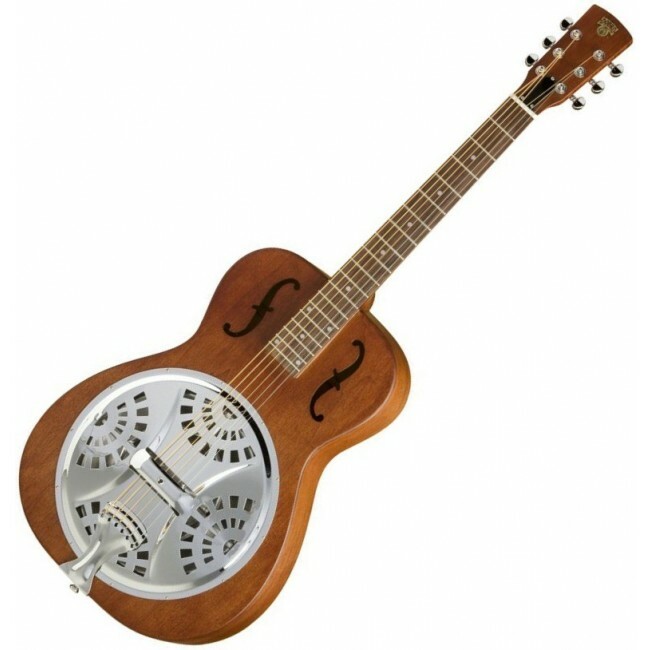 The wood resonator or resophonic style guitar became a national phenomenon thanks to Dobro® pioneer Bashful Brother Oswald, who became the instrument’s ambassador performing it weekly on the Grand Ole Opry for over 60 years. The resonator guitar is not just an iconic instrument for bluegrass and traditional American music. In the last decade, popular artists in country, blues, and bluegrass have rediscovered the beautiful and challenging Dobro. Historic Tone With A Twist In addition to the bridge’s ebony saddle which sits atop a maple base, the full warm tone of the Hound Dog Deluxe Squareneck is enhanced and projected by a new proprietary nickel plated Dobro® cone with a nickel fan cover plate and round sound holes with screens and classic f holes. The Hound Dog Deluxe Squareneck really howls thanks to a cutting edge FishmanTM resonator pickup. Fishman pickups are world famous for providing players smooth and flexible amplification that retains an instrument’s true acoustic tone.